Degenerate matter is a highly dense state of fermionic matter in which particles must occupy high states of kinetic energy to satisfy the Pauli exclusion principle. The description applies to matter composed of electrons, protons, neutrons or other fermions. The term is mainly used in astrophysics to refer to dense stellar objects where gravitational pressure is so extreme that quantum mechanical effects are significant. This type of matter is naturally found in stars in their final evolutionary states, like white dwarfs and neutron stars, where thermal pressure alone is not enough to avoid gravitational collapse. Degenerate matter is usually modelled as an ideal Fermi gas, an ensemble of non-interacting fermions. In a quantum mechanical description, particles limited to a finite volume may take only a discrete set of energies, called quantum states. The Pauli exclusion principle prevents identical fermions from occupying the same quantum state. At lowest total energy (when the thermal energy of the particles is negligible), all the lowest energy quantum states are filled. This state is referred to as full degeneracy. This degeneracy pressure remains non-zero even at absolute zero temperature. Adding particles or reducing the volume forces the particles into higher-energy quantum states. In this situation, a compression force is required, and is made manifest as a resisting pressure. The key feature is that this degeneracy pressure does not depend on the temperature but only on the density of the fermions. Degeneracy pressure keeps dense stars in equilibrium, independent of the thermal structure of the star. A degenerate mass whose fermions have velocities close to the speed of light (particle energy larger than its rest mass energy) is called relativistic degenerate matter. The concept of degenerate stars, stellar objects composed of degenerate matter, was originally developed in a joint effort between Arthur Eddington, Ralph Fowler and Arthur Milne. Eddington had suggested that the atoms in Sirius B were almost completely ionised and closely packed. Fowler described white dwarfs as composed of a gas of particles that became degenerate at low temperature. Milne proposed that degenerate matter is found in most of the nucleus of stars, not only in compact stars. where Δp is the uncertainty in the particle's momentum and Δx is the uncertainty in position. Therefore, even though the plasma is cold, such particles must on average be moving very fast. Large kinetic energies lead to the conclusion that, in order to compress an object into a very small space, tremendous force is required to control its particles' momentum. 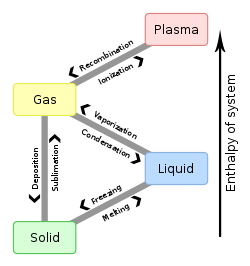 where K again depends on the properties of the particles making up the gas. All matter experiences both normal thermal pressure and degeneracy pressure, but in commonly encountered gases, thermal pressure dominates so much that degeneracy pressure can be ignored. Likewise, degenerate matter still has normal thermal pressure, but at extremely high densities, the degeneracy pressure usually dominates. Exotic examples of degenerate matter include neutron degenerate matter, strange matter, metallic hydrogen and white dwarf matter. Degeneracy pressure contributes to the pressure of conventional solids, but these are not usually considered to be degenerate matter because a significant contribution to their pressure is provided by electrical repulsion of atomic nuclei and the screening of nuclei from each other by electrons. In metals it is useful to treat the conduction electrons alone as a degenerate free electron gas, while the majority of the electrons are regarded as occupying bound quantum states. This solid state contrasts with degenerate matter that forms the body of a white dwarf, where most of the electrons would be treated as occupying free particle momentum states. Degenerate gases are gases composed of fermions such as electrons, protons, and neutrons rather than molecules of ordinary matter. The electron gas in ordinary metals and in the interior of white dwarfs are two examples. Following the Pauli exclusion principle, there can be only one fermion occupying each quantum state. In a degenerate gas, all quantum states are filled up to the Fermi energy. Most stars are supported against their own gravitation by normal thermal gas pressure, while in white dwarf stars the supporting force comes from the degeneracy pressure of the electron gas in their interior. In neutron stars, the degenerate particles are neutrons. A fermion gas in which all quantum states below a given energy level are filled is called a fully degenerate fermion gas. The difference between this energy level and the lowest energy level is known as the Fermi energy. In an ordinary fermion gas in which thermal effects dominate, most of the available electron energy levels are unfilled and the electrons are free to move to these states. As particle density is increased, electrons progressively fill the lower energy states and additional electrons are forced to occupy states of higher energy even at low temperatures. Degenerate gases strongly resist further compression because the electrons cannot move to already filled lower energy levels due to the Pauli exclusion principle. Since electrons cannot give up energy by moving to lower energy states, no thermal energy can be extracted. The momentum of the fermions in the fermion gas nevertheless generates pressure, termed 'degeneracy pressure'. Under high densities the matter becomes a degenerate gas when the electrons are all stripped from their parent atoms. In the core of a star, once hydrogen burning in nuclear fusion reactions stops, it becomes a collection of positively charged ions, largely helium and carbon nuclei, floating in a sea of electrons, which have been stripped from the nuclei. Degenerate gas is an almost perfect conductor of heat and does not obey the ordinary gas laws. White dwarfs are luminous not because they are generating any energy but rather because they have trapped a large amount of heat which is gradually radiated away. Normal gas exerts higher pressure when it is heated and expands, but the pressure in a degenerate gas does not depend on the temperature. When gas becomes super-compressed, particles position right up against each other to produce degenerate gas that behaves more like a solid. In degenerate gases the kinetic energies of electrons are quite high and the rate of collision between electrons and other particles is quite low, therefore degenerate electrons can travel great distances at velocities that approach the speed of light. Instead of temperature, the pressure in a degenerate gas depends only on the speed of the degenerate particles; however, adding heat does not increase the speed of most of the electrons, because they are stuck in fully occupied quantum states. Pressure is increased only by the mass of the particles, which increases the gravitational force pulling the particles closer together. Therefore, the phenomenon is the opposite of that normally found in matter where if the mass of the matter is increased, the object becomes bigger. In degenerate gas, when the mass is increased, the pressure is increased, and the particles become spaced closer together, so the object becomes smaller. Degenerate gas can be compressed to very high densities, typical values being in the range of 10,000 kilograms per cubic centimeter. There is an upper limit to the mass of an electron-degenerate object, the Chandrasekhar limit, beyond which electron degeneracy pressure cannot support the object against collapse. The limit is approximately 1.44 solar masses for objects with typical compositions expected for white dwarf stars (carbon and oxygen with 2 baryons per electron). This mass cutoff is appropriate only for a star supported by ideal electron degeneracy pressure under Newtonian gravity; in general relativity and with realistic Coulomb corrections, the corresponding mass limit is around 1.38 solar masses. The limit may also change with the chemical composition of the object, as it affects the ratio of mass to number of electrons present. The object's rotation, which counteracts the gravitational force, also changes the limit for any particular object. Celestial objects below this limit are white dwarf stars, formed by the gradual shrinking of the cores of stars that run out of fuel. During this shrinking, an electron-degenerate gas forms in the core, providing sufficient degeneracy pressure as it is compressed to resist further collapse. Above this mass limit, a neutron star (partially supported by neutron degeneracy pressure) or a black hole may be formed instead. Neutron degeneracy is analogous to electron degeneracy and is demonstrated in neutron stars, which are partially supported by the pressure from a degenerate neutron gas. The collapse may happen when the core of a white dwarf is above the vicinity of 1.4 solar masses, which is the Chandrasekhar limit, and the collapse is not halted by the pressure of degenerate electrons. As the star collapses, the Fermi energy of the electrons increases to the point where it is energetically favorable for them to combine with protons to produce neutrons (via inverse beta decay, also termed electron capture and "neutronization"). The result is an extremely compact star composed of nuclear matter, which is predominantly a degenerate neutron gas, sometimes called neutronium, with a small admixture of degenerate proton and electron gases (and at higher densities, muons). Neutrons in a degenerate neutron gas are spaced much more closely than electrons in an electron-degenerate gas because the more massive neutron has a much shorter wavelength at a given energy. Typical separations are comparable with the size of the neutron and the range of the strong nuclear force, and it is actually the repulsive nature of the latter at small separations that primarily supports neutron stars more massive than 0.7 solar masses (which includes all measured neutron stars). In the case of neutron stars and white dwarfs, this phenomenon is compounded by the fact that the pressures within neutron stars are much higher than those in white dwarfs. The pressure increase is caused by the fact that the compactness of a neutron star causes gravitational forces to be much higher than in a less compact body with similar mass. The result is a star with a diameter on the order of a thousandth that of a white dwarf. There is an upper limit to the mass of a neutron-degenerate object, the Tolman–Oppenheimer–Volkoff limit, which is analogous to the Chandrasekhar limit for electron-degenerate objects. The limit for objects supported by ideal neutron degeneracy pressure is only 0.75 solar masses. For more realistic models including baryon interaction, the precise limit is unknown, as it depends on the equations of state of nuclear matter, for which a highly accurate model is not yet available. Above this limit, a neutron star may collapse into a black hole or into other, denser forms of degenerate matter (such as quark matter) if these forms exist and have suitable properties (mainly related to degree of compressibility, or "stiffness", described by the equations of state). Sufficiently dense matter containing protons experiences proton degeneracy pressure, in a manner similar to the electron degeneracy pressure in electron-degenerate matter: protons confined to a sufficiently small volume have a large uncertainty in their momentum due to the Heisenberg uncertainty principle. However, because protons are much more massive than electrons, the same momentum represents a much smaller velocity for protons than for electrons. As a result, in matter with approximately equal numbers of protons and electrons, proton degeneracy pressure is much smaller than electron degeneracy pressure, and proton degeneracy is usually modelled as a correction to the equations of state of electron-degenerate matter. At densities greater than those supported by neutron degeneracy, quark matter is expected to occur. Several variations of this hypothesis have been proposed that represent quark-degenerate states. Strange matter is a degenerate gas of quarks that is often assumed to contain strange quarks in addition to the usual up and down quarks. Color superconductor materials are degenerate gases of quarks in which quarks pair up in a manner similar to Cooper pairing in electrical superconductors. The equations of state for the various proposed forms of quark-degenerate matter vary widely, and are usually also poorly defined, due to the difficulty of modeling strong force interactions. Quark-degenerate matter may occur in the cores of neutron stars, depending on the equations of state of neutron-degenerate matter. It may also occur in hypothetical quark stars, formed by the collapse of objects above the Tolman–Oppenheimer–Volkoff mass limit for neutron-degenerate objects. Whether quark-degenerate matter forms at all in these situations depends on the equations of state of both neutron-degenerate matter and quark-degenerate matter, both of which are poorly known. Quark stars are considered to be an intermediate category among neutron stars and black holes. At densities greater than those supported by any degeneracy, gravity overwhelms all other forces. The stellar body collapses to form a black hole, though this is not well modeled by quantum mechanics. At the same time, the material must be converted from fermions, subject to degeneracy pressure, to bosons, which are not. Current hypothesis suggest gluons as the most likely boson thought possible. In the frame of reference that is co-moving with the collapsing matter, general relativity models without quantum mechanics have all the matter ending up in an infinitely dense singularity at the center of the event horizon. (If one uses the UFT Einstein–Maxwell–Dirac system or its generalizations, then the singularity is avoided and one ends up with a quark star, possibly surrounded by an event horizon.) It is a general result of quantum mechanics that no fermion can be confined in a space smaller than its own wavelength, making such a singularity impossible, unless only bosons are present, but there is no widely accepted theory that combines general relativity and quantum mechanics sufficiently to tell us what the structure inside a black hole might be. If bosons can be conclusively ruled out, one possible theory is that constituent particles decompose into strings, forming a structure called a fuzzball. ^ Fowler, R. H. (1926-12-10). "On Dense Matter". Monthly Notices of the Royal Astronomical Society. 87 (2): 114–122. Bibcode:1926MNRAS..87..114F. doi:10.1093/mnras/87.2.114. ISSN 0035-8711. ^ David., Leverington, (1995). A History of Astronomy : from 1890 to the Present. London: Springer London. ISBN 1447121244. OCLC 840277483. ^ Potekhin, A. Y. (2011). "The Physics of Neutron Stars". Physics-Uspekhi. 53 (12): 1235. arXiv:1102.5735. Bibcode:2010PhyU...53.1235Y. doi:10.3367/UFNe.0180.201012c.1279. Cohen-Tanoudji, Claude (2011). Advances in Atomic Physics. World Scientific. p. 791. ISBN 978-981-277-496-5.